Luminosity masks aren’t for every image, but they are incredibly powerful on images that contain subtle or complex tone ranges. Luminosity masks paired with Photoshop Adjustment Layers let you target your adjustments to specific tones. For example, you can subtly enhance contrast in just the highlights or shadow ranges of your image, and you don’t need to worry about using brushes. 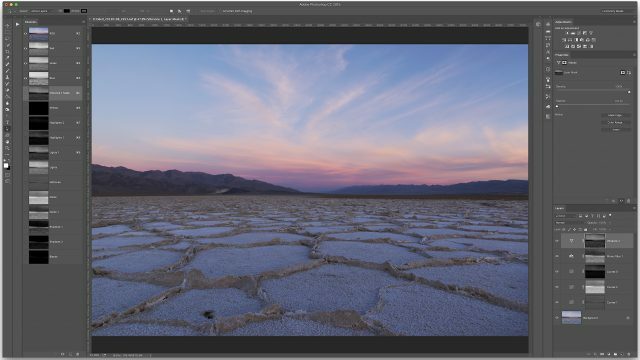 See how luminosity masks make using the Curves Tool in Photoshop far easier and more powerful! How can I create luminosity masks? Luminosity masks are created by making selections and storing them in Photoshop’s Channels Panel. You then load these channels as selections to use as layer masks. Luminosity masks are unique to each image, as they are based on the actual pixels in your photograph. The easiest way to create these masks is to use Photoshop Actions. Luminosity masks require the use of Adobe Photoshop. I’ve created a complete set of actions that allow you to quickly produce 16-bit luminosity masks on any image. My complete set of actions includes the 11 standard (basic) masks, 11 Zone Masks (for even more targeted selections) and the Expanded Midtones (3 masks) for adjusting midtones while protecting the bright and dark tones in digital photographs. The complete set of actions is only available through my PDF eBook tutorial, Mastering Luminosity Masks. However, you can get my Basic Luminosity Mask action set for free here. Mastering Luminosity Masks includes actions for creating 25 luminosity masks in Photoshop, and will take you through all the steps for using them to enhance your images. loved your video on Luminosity Masking. The page will not open. Thanks Jason! This tutorial was very helpful! Look forward to experimenting. What page are you referring to, so I can fix it? Is the free download of the luminosity masks still available? Thank you for the action and video! I really need to start using this.